Tired of waiting in the long customs lines with all the other suckers? If you’re a regular business person in Asia, this article will take a bit to read through but will save you hours and hours of time in border lines all across Asia – so pay attention! For frequent travelers in Asia, we are now from the gods with a new card for VIP treatment at customs security. I thought it was APAC card (my logic was it is Asia Pacific – APAC) – but it is an APEC card which stands for Asia Pacific Economic Cooperation. A lot of my friends are either processing one and I recently went through the process. I started writing this guide as soon as I filed it, and have been updating it along the way. So you can read along as I go through the process. Plus it’s still fresh in my mind. In a rush and want to keep this APEC guide so you can access on your computer or mobile phone later? We have prepared this specifically for you so you can grab it when you need it! Download the PDF Guide Now! Governments seem to love using acronyms! Maybe it is the military side spilling over into civilian use? Or just easier to explain to people. Whatever the case, there are a lot in this guide! Doing my online research, I could only find government websites with tons of acronyms. I thought before you read too far into this, let’s get some of these acronyms that you’ll come across on a regular basis. APEC – Asia Pacific Economic Cooperation. We’ll go into details on what this is in the next section. ABTC – APEC Business Travel Card (ABTC). The physical card you’ll receive to cross the borders with. CBP- This is the U.S. Customs and Border Protection department. For both humans as well as products coming in and out of USA land. GOES – Global Online Enrollment System. This is the online system for applying and managing your frequent traveler programs. SENTRI – Secure Electronic Network for Travelers Rapid Inspection. for frequent travelers between USA, Canada, and Mexico. NEXUS – Couldn’t find anywhere on the web what it stands for. Maybe just a name, and not an acronym? The NEXUS program allows pre-screened travelers faster entry and exit between the United States and Canada. 1-866-NEXUS 26 (1-866-639-8726). FAST: Free and Secure Trade for Commercial Vehicles. This is for those truck drivers and cargo companies who have products coming in and out of Canada, US, and Mexican borders. GE – Global Entry. For international travelers to get in and out of border crossings faster. If you want to dig into these various travel programs, you can find the official CBP site here covering all Travel Programs. Today I will focus on APEC, as well as the Global Entry as it’s required for APEC card holders. So What is APEC Exactly? Now that we have some basic definitions of various travel programs, let’s dig into APEC. So the ABTC is what you need to card for. This is the card to give you the fast track – VIP at customs and border crossings! Like the golden ticket at Willy Wonka’s Chocolate factory, well not that cool – but pretty close. You will get preferential treatment when processing at foreign borders in Asia. Carry this ABTC card with you just like you would with your passport. Its best to keep it with your passport at all times. The ABTC is one program in APEC, which aims to facilitate travel of business people in the Asia-Pacific region. How? By providing simpler short-term entry procedures. When Did This ABTC Card Start? I can’t find out when they made the card available. From research it seems they passed the bill in 2011. But there is definitely information about when it ends. In the legislation it authorizes the Department of Homeland Security to issue U.S. APEC Business Travel Cards until Sept. 30, 2018. The legislation might extend it, but we don’t know. We can watch the law and see if it is extend after that date. Most likely they’ll see how this first phase goes. Update May 2017: We have a blog reader who has this to say – seems it will no longer stop in September 2018! Legislation has been introduced in the U.S. Congress to make the APEC Business Travel Card for U.S. citizens permanent. How Long Does an ABTC Last Once You Get It? Three years after issue date. The card will have the expiration on it. Also if your passport is expiring in less than three years, then the APEC card will expire at the same date as the passport. What Airports & Border Crossings in Those Countries Accept APTC Cards? So you’re jumping up and down that you can get through some of these border lines faster? Before applying, you might want to check this list of which places support accepting the card. But keep in mind it has not updated since 2008. For example, it doesn’t list Shenzhen / Hong Kong borders, but they accept them now. This article focuses on US citizens for processing their ABTC card. Reading all the government websites, they said it is possible for non Americans to get it, but it doesn’t say how. So if you’re reading this and not a US citizen, I’d suggest you search your local country government’s website. 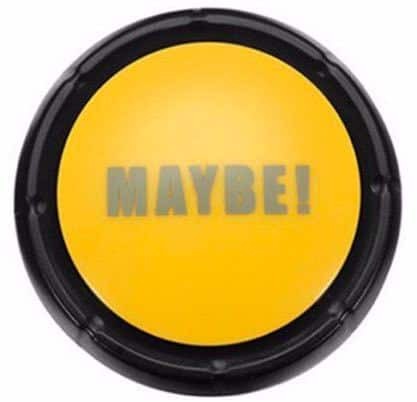 I’d love to hear how it goes – leave a comment about it if you can. Keep in mind, US government websites (this FAQ is good), explain that the US APEC Business Travel Card (ABTC) is for US Citizens. The process different from foreigners – but still works as global entry in US borders. So don’t think its keeping out non-Americans from the program. · Have a current membership in a CBP trusted traveler program such as SENTRI, NEXUS, or Global Entry. If you don’t, you’ll need to apply for that first (we’ll cover it below, don’t worry). This means they will check criminal record databases and do other background checks. 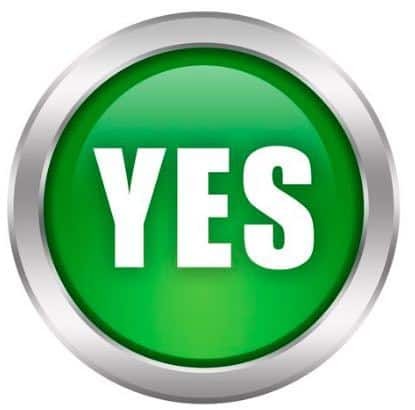 · Be a verified business person actively engaged in Asia Pacific related business or a U.S. government official. So I believe I should qualify (as of writing this my application is still pending). They approved friends and associates of mine doing similar business. That is, living in Asia and doing business between countries. I am not sure if they look at where you are living as part of it (I’ll try to ask during my interview). I am sure that during their research they see you have a Hong Kong company and have been living in Asia for many years as strong qualifications. The main role of the GE card is to enable Global Entry members to use NEXUS/SENTRI lanes. When you apply for this program, you can check a box and apply for your APEC card at the same time. If you want to check for locations that accept it http://www.cbp.gov/travel/trusted-traveler-programs/global-entry/locations has a running list. Again not the most up to date, so check next time you cross your regular border check with the border patrol. I will include applying for this Global Entry Program as part of the steps below. Ok, let’s get online and start filling this puppy out! Use the Global Online Enrollment System (GOES) and you can login via this GOES page. If you already have an account and are in the Global Entry program, life is simple for you. Login and check a box that you want to add in the APEC program. This will add the APEC Business Traveler Card. If you are not already a CBP trusted traveler then you must schedule a visit to any CBP trusted traveler enrollment center. You’ll have an interview and submit your electronic signature. To make it faster, you can create a GOES Online Account and apply online and then do the interview. Apply for APEC card via Hong Kong via form id900. Fee from HK: After digging, found in form ID912 that the fee for a new APEC card is 590 HKD (about $75 USD) – so cheaper than getting it from America. must be a bona fide business person who needs to travel frequently on short term visits within the APEC region to fulfill business commitments. Before we go into the next steps, also please note that you need to pay a fee. There are 2 fees if you have not yet applied for the Global Entry program before. 1) The application fee for Global Entry Program is $100 US dollars. You can also choose another Customs Border Patrol Trusted Travel Program if you’d like. To me, it seems the most common choice would be the Global Entry Program. 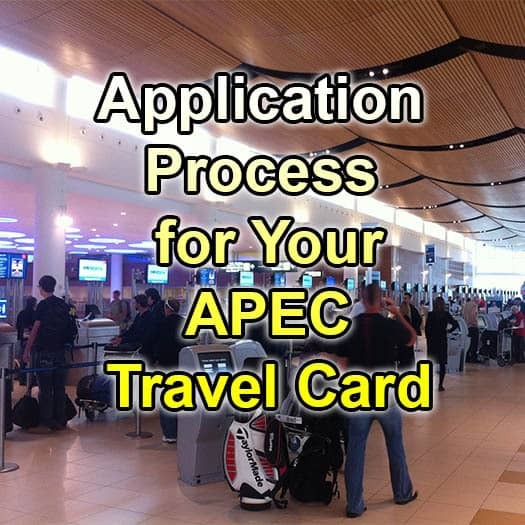 2) The application fee for the U.S. APEC Business Travel Card is $70. The fees are non-refundable. So if this is your first time to do any of this (like me) budget $170 US dollars. I was able to pay by credit card online. They also have US bank transfer available as well. So now we’re mentally ready. Have $170 bucks and about thirty minutes or so of application time. Now let’s cover what you need to submit so you can have everything ready. You will then need to upload a scanned copy of your passport. This might be a tricky one for frequent travelers in Asia. But to the government, they expect you to have a primary residence. For me, I am pretty stable now in Hong Kong and China. In the application the dropdown for country didn’t have Hong Kong, so I had to select China as the country. Might upset some people living and originating in Hong Kong. Prepare for this, but I feel it would work for the application process. Do you currently have an active driver’s license? 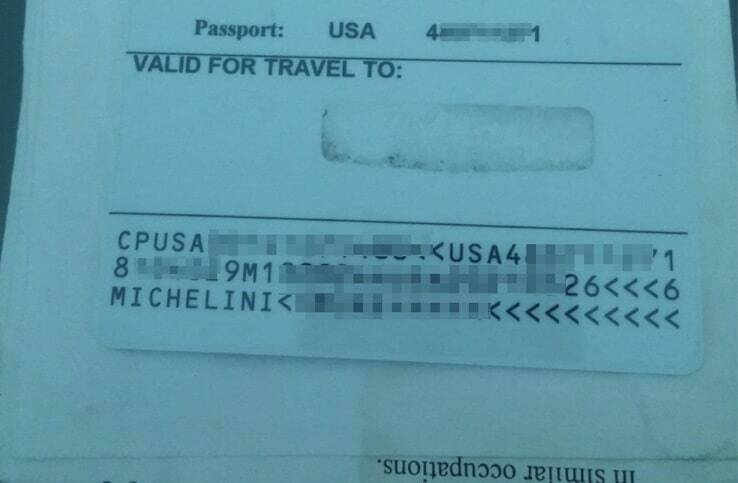 Not sure if an overseas or international driver’s license is acceptable. I don’t have any current driver’s license, let mine in USA expire years ago. If you have one, it should help them do the background check. Where you’re currently living? Might be the same as primary residence, unless you have situations where you’re living on the road? Fill it out as best as you can. It makes sense that those applying for this program don’t live in USA. So in the application they will ask for you to put a US contact person. This is where they mail the GE card will if accepted into the program. For the as of date field, I assume that means when this person became your US contact? For me I put down my father. Hope it doesn’t cause any hassle for him. I believe it is best to talk to this person before putting their name on this application to make sure things according to plan. All the places you have lives in the past 5 years. Yup, I know some globe trotters that could spend hours on this one here. Not sure how to help ya there! Another tricky one for entrepreneurs out there. You need to list out the companies you have worked for in the past 5 years. Also they need the address is of each company. While I have had a lot of ventures, I have lucky enough to operated under my “umbrella” corporation Shadstone Limited, with the Chinese subsidiary in Shenzhen. I think you can save the application at this step and come back to it. But I’d recommend having all this ready before starting the process. Have you traveled to countries other than the United States, Canada, and Mexico within the past 5 years? 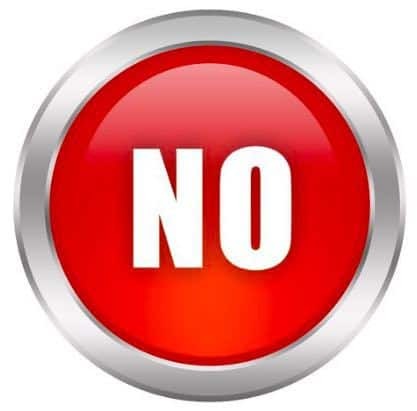 Well, if you’re applying for the APEC card, then most likely this is a yes! They don’t ask for dates (luckily), but I did my best to remember all the countries I have been to in the past 5 years. This one wasn’t applicable to me. Still not 100% clear. Doing more web research on it seems that it is applicable if you are going for the SENTRI application with Mexico. Seems it applies to residents of Mexico. So think most of you can skip past this step. Here are the scarier questions. But you should know the answers to these as soon as you read them. I talked to one person who has a criminal record, and still got the APEC card. So, as most things in life, don’t lie here. If you have a criminal record, they will find out anyway. Have you ever been convicted of a criminal offense in the United States or any other country? Have you ever received a waiver of inadmissibility to the U.S. from a U.S. government agency? Have you ever been found in violation of customs laws? Have you ever been found in violation of immigration laws? Yay! You’re done. Now you can go forward to pay the fee(s) for the programs. This was $170 USD for me, as I had to do both the Global Entry (100 bucks) and the APEC (70 bucks). Can pay be Visa or MasterCard, so not too painful. Once you finish the payment, you will now see in the online dashboard “initial enrollment” status. You need to check the status and login to this dashboard to see if there are any updates. Your application for the Trusted Traveler program is now pending review. PLEASE REMEMBER TO REVISIT OUR WEB SITE FOR YOUR APPLICATION STATUS UPDATES. They will update your application status and notify you when you can schedule an interview appointment via your online GOES account. 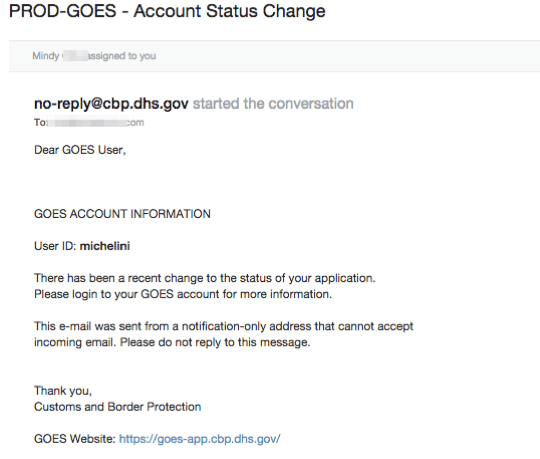 CBP recommends you periodically login to your GOES account at https://goes-app.cbp.dhs.gov for account updates. I can’t remember if I got an email notification or had to check by hand on the regular, but I was pretty excited about the whole thing. We are pleased to inform you that your U. S. Customs and Border Protection, Global Entry and Asia Pacific Economic Cooperation (APEC) Business Travel Card (ABTC) membership application has been processed and you are now invited to visit an enrollment center to complete the enrollment process. In order to finalize your Global Entry enrollment, you must schedule your Global Entry Interview within 30 days of the date of this letter. You do not have to complete the interview within 30 days. To do this, please log in through GOES (Global Online Enrollment System) using the user name and password you established when you completed your initial application. Once you have logged in, please schedule your interview using the blue “Schedule Interview” button located on the right side of the screen. If you have already visited the enrollment center for this application, please disregard this letter. * Documents providing evidence of residency. Examples are: driver’s license (if the address is current), mortgage statement, rental payment statement, utility bill, etc. When you visit the Enrollment Center, we will review your application and any additional information you provide at that time. We will verify your identity, review your documentation, and take your fingerprints and photograph. Finally, we will explain the terms and conditions of the Global Entry program, collect your signature to complete your ABTC enrollment, and answer any questions or concerns you may have. Your Global Entry membership number is, 9999999, if your account is approved, this will become your Known Traveler Number for your TSA Pre-Check benefit. For more information on the TSA Pre-Check program please visit their web site at www.tsa.gov/tsa-precheck. Thank you for applying to the Global Entry Program and ABTC. If you have any questions, please visit the Global Entry website at www.globalentry.gov. You may also contact the CBP Info Center at (877) 227-5511 or by visiting their website at https://help.cbp.gov. After checking the GOES website to see they accepted me into the program or not, now I I had to schedule an interview. There is a long list of places you can get the interview. I booked my interview while I was traveling in USA at the Palm Beach Port. It is every 30 minutes from 8am to 4pm I believe. I am not sure if I mis-read the website or what, but when I went to the interview, I thought it was in the PBI (West Palm Beach) airport. It was not connected to the airport, it was a few exits away on Interstate 95! About a 15 minute drive. Also had some train tracks to cross as it was right in the port and a shipment had come in (waiting for the train to load up and pass for about 30 minutes before crossing the intersection). Maybe I should have booked the interview at a bigger airport center? Anyway, when picking the location to get your interview, don’t assume it is in the airport. After getting there, it was smooth! The directions were perfect and I took the elevator to the third floor. Sitting down for just a few minutes, they called me into one of the two interview rooms. The customs official was polite. Took my passport, didn’t need my confirmation number, looked me up. Asked a couple questions and then took my photo and my fingerprints. A few more minutes he filled out the forms on his computer. Whole process took about ten minutes. Because I was doing APEC card as well as GE, I had to give them my signature. This interview room didn’t have the machine to collect my signature so I had to wait for just a few more minutes to go to the next interview room to have them collect it. Note: I wish I had booked the interview at the beginning of the trip. After my interview was over, he explained that they would mail the cards (Global Entry and APEC) to my USA address on the application. It would take 7 to 10 business days. There isn’t a way for them to mail the cards international. So I’ll have to have my father FedEx the cards to me in Hong Kong. If I had booked the interview at the beginning of the trip it would have been fine. Then again, I would have been too tired after landing at the airport. Having to go to an interview off the plane with my wife and kid waiting would have been a different challenge. So keep that in mind when choosing the date for your interview. How long should you budget for the interview? I’d suggest to budget about 30 minutes. Though when I asked them how long (I called the day before) they said it should be fast but if there is a computer issue it could be a big delay. So cross your fingers there isn’t a computer issue. Maybe it’s safer to book your interview after you arrive at your destination. For me, I had to rush to the airport to catch my flight after the interview, as I had to drive between the interview center and the airport. Interview In Singapore As Well? My friend Marshall told me he could have interviewed for his APEC card in Singapore. Before he got to test it, he took a trip to USA anyway so did the interview there. Have you been able to book an interview for your APEC card in Singapore? Please let me know in comments or email me! I’m sure many of you are nervous about this interview with US Customs. I do admit, it is intimidating. I walked into the center and it was just so quiet (wish there was some dentist office music to take the edge off) and I took my seat. 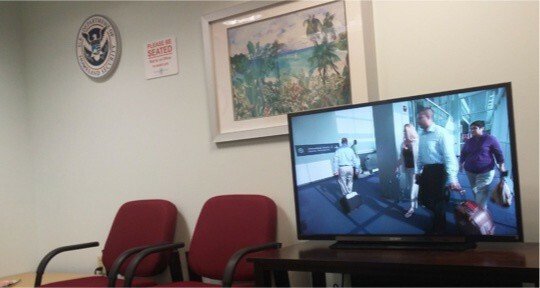 They did have a nice waiting room with some commercial of the power of border crossing in today’s generation. Also worth noting, this “temporary card” won’t work for Asia travel. It will work for domestic USA flights to go in the priority TSA line by typing this code in when you check in at your flight. We are pleased to inform you that your U. S. Customs and Border Protection (CBP), Global Entry program membership has been approved. You may use the program as soon as you receive and activate your new Global Entry card. In addition, we are pleased to inform you that your U. S. Asia-Pacific Economic Cooperation (APEC) Business Travel Card (ABTC) has been approved. Your new ABTC will arrive in 3 weeks. As a U.S. ABTC holder you are required to have in your possession a valid U.S. passport and any additional required entry documentation, such as a visa. Your ABTC membership will expire three years from the date of issue or at the expiration of your passport, whichever comes first. Your membership expiration date can be found on the front or back of your card or by accessing your GOES account. Your ABTC membership will no longer be valid if your Global Entry, NEXUS or SENTRI membership is not in the active status. Please visit globalentry.gov to review the program criteria for detailed information; and for a complete listing of economies where the temporary ABTC is accepted. If you enrolled in Global Entry, you may begin using the kiosk immediately. Global Entry cards are only issued to Global Entry members who are U.S. citizens, Lawful Permanent Residents or Mexican Nationals (who are not current SENTRI members). Global Entry cards are not valid at the Global Entry kiosks. Please visit http://www.cbp.gov/global-entry/about to review the program criteria for detail information. As a reminder, you must closely adhere to the program requirements and any violation of law or regulation may lead to the revocation of your program participation, and could result in the issuance of a penalty, seizure action, or criminal prosecution. Please periodically review the program requirements provided during your enrollment interview. Thank you for applying to the CBP’s Trusted Traveler Programs and ABTC. For more information regarding Global Entry, please contact an enrollment center nearest you, or visit http://www.cbp.gov/global-entry/about. Your GE card request will be reviewed and, upon approval, a card will be sent to your current U.S. mailing address within 4-6 weeks. You must activate your GE card prior to use and with-in 30 days of receipt. To learn how to activate your card please click here. You will see a box on the page, click on “Activate Membership Card”, enter your card’s PASSID and Security Code and click Next. So after the email approval email, which came the same day as the interview, they mailed the card out. Unfortunately for me, I had my international flight that same day after my interview. The customs official told me they must mail the Global Entry card to my USA address. My dad called me that next week to tell me that the GE card had arrived. But I was already in the airport heading to Asia! I spent a few more days in California before going East. I told him to hold the card, as the APEC card was also coming behind it, and to mail all together. This is where it is interesting. They mailed my APEC card to my overseas address – in “China” (well Hong Kong, but they didn’t have Hong Kong as a country in the dropdown). Getting the APEC card took about 3 weeks after getting approval in the interview. Maybe it took that longer because they shipped it overseas via post. Here is the actual card I got. People have been asking what the back side of the APEC card means. That these new cards do not require it. Even though it says ‘countries allowed’ (or something like that) printed in back of the card, you can’t get any countries listed on it because the new Cards don’t require it. He went on to say that it’s not possible to have it done with countries on the back and to let border people know if I get into a situation at checkpoint again. I have confirmed similar over the years having this. But it still confuses some customs officials and I need to explain. How I have been Using The APEC Card. card was waiting for me in my Hong Kong address. I grabbed the card, no activation needed, and took it with me when I crossed into Mainland China. It depends on which border you cross. When I was on the Hong Kong border, I could go into the “VIP” lane instead of the visitor lane. That saved me at least 30 minutes on this first time usage – as the line was almost out the door on the visitor line. I had 2 people in queue ahead of me, so got through in 5 minutes. On the China side, at Huanggang border, I didn’t see a APEC or Diplomat line. So was stuck in the general “foreigner” line which had about 15 people in line. I’ll keep searching for spots to use the APEC card. If you know some tips and tricks on using it in China, let me know. I asked the customs official when I got there, but she thought I wanted to use it as a China visa. Just some language miscommunication, so I gave up to not delay my entering the country. 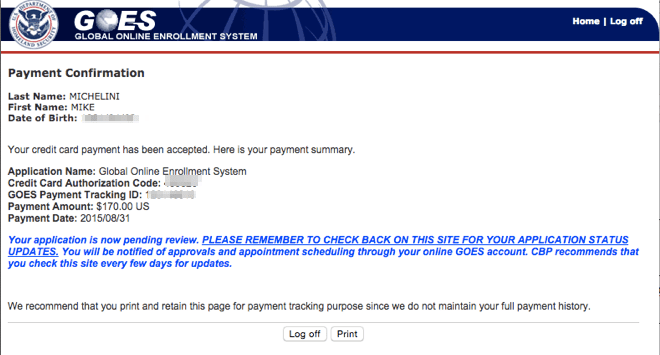 They remind you that you are responsible to update your information in the “Global Online Enrollment System”. These are things like changes in your address, passport, or immigration status. The immigration status you need to update in person at an enrollment center. So you can still get scanned and examed crossing the border. If you’re caught violating the customs rules like smuggling in things that aren’t allowed or not declaring, you will jeopardize you access card and worse. Below are some core pages I used to write up today’s guide. 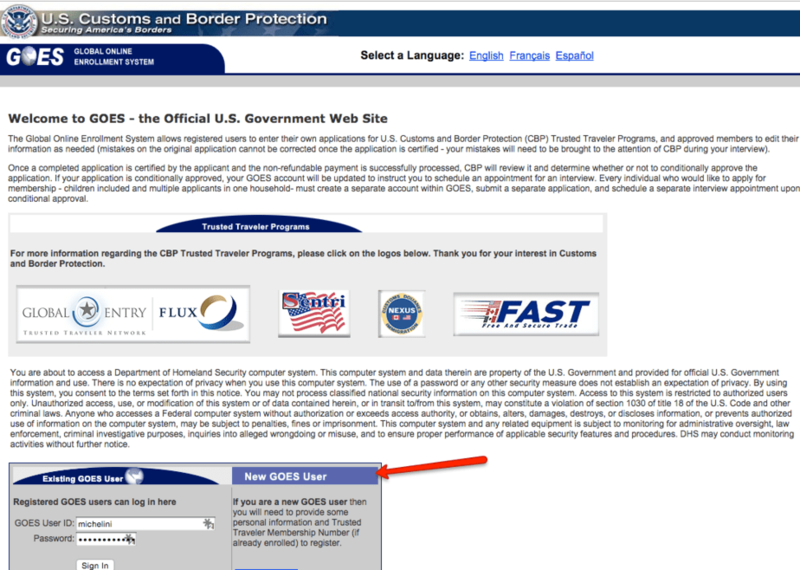 GlobalEntry.gov – this is the website for the GE (Global Entry) program. It will have the latest maps and developments on the program. And if you have specific questions, this is the contact information. or phone at 855-USE GOES (873-4637) or (202) 325-8060. Also, once you schedule your interview, you will receive the contact information of that local unit. I called them up the day before my interview and they picked up the phone right away. I had a helpful agent who answered all my little questions. Made me a lot more comfortable before getting up early and getting to the interview the next day. All these different programs was the more confusing part to me when I got started with the process. There are all these separate programs for crossing the border. Global Entry is the core program that you need as a base. Then to get the Asia card, you need to select that option while going through the GE application. And during your interview, tell them about the APEC card as well – as they need to collect an extra signature. Hope this guide helped you out. It was painful digging through various government FAQ pages and separate pages for various programs. If you can share your experience, there may be differences for different people and different situations. How Long Does It Take To Get The APEC Card? People are asking us how long the process takes. Remember it is a couple steps – you need a Global Entry card and then an APEC card and also schedule the interview. I’d budget a couple months. 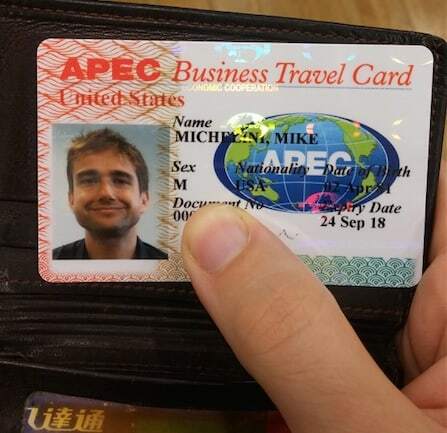 One of the partners in our firm has their middle initial missing on their APEC card so it does not match the name as it appears on his U.S. Passport and this has caused delays at the China airport. How do we remedy this please? Tough one! I think the best bet is to login to the GOES website with the username for that APEC card and see if there is a way to edit it. That is where I edited my mailing address and re-ordered a lost APEC card. Update Dec 21, 2015 I lost my APEC card! After all that work too. I kept it inside my passport, and I think it slipped out while going between borders…don’t recommend holding it there – will put in wallet next time. I searched online and couldn’t find anything about a lost or stolen APEC card. I logged back into my CBP web portal, and into the GE card program, there was a drop down menu for programs – and luckily I could find a menu item for replacement APEC card. Clicking that, I ended up paying $25 USD for a new card, and it should arrive in the mail in my Hong Kong address in 3 weeks. Hopefully sooner… will update once I find out more. Lost My APEC Card. Again. To refresh this section, I lost my wallet a couple weeks ago! And, on top of credit cards and Octopus card, it had my APEC card. Tragic, I know. But really, I have to say it wasn’t too big of a deal to order a new one from the government website. I logged into my account and clicked into lost my card. I confirmed my address, and paid the $25 USD to get a new one mailed to me. It arrived in less than 2 weeks, to my Hong Kong office, no issues. While of course I don’t recommend losing your APEC card (or wallet!) – don’t stress too much about losing your APEC card. And I don’t think someone can use it to impersonate me – it isn’t really a “driver’s license” or passport – so I’m not too concerned about that either. So far, I haven’t seen any specific requirements. The main idea is that they want to see you are in Asia on a regular basis and have an address here. Think you should be OK. I Need a Chinese Residence Card? i want to confirm if someone living in the mainland china with Chinese residence card can apply for this card. Sure! You just need to prove that you do business in Asia – and are a passport holder of a participating country. Living in China with residence card is not a factor. How About Your APEC Card Experience? Now it is your turn! I’d love to hear your experience applying for and using the APEC card. I have thanked myself so many times when I entered a busy Thailand airport customs border as well as a backed up Philippines Customs line – how about you – check the comment section below. Do You Think the APEC Card Is Worth It? Looking into Things Do You Think APEC card is worth the investment? Is The APEC Card Worth It? For the fees and paperwork, is it worth filing? Take this APEC card information with you wherever you go! Nice, didn’t know you could get it now with US passport. Knew someone that had it from Korea and we always went to the fast lane when he showed his APEC card. Ya – I heard it a couple times over beers but was never sure. Hope this post helps people- you should apply – you’re in USA anyway and it will be pretty easy for you. Should You Live in Hong Kong or Shenzhen, China? do you just need to show your APEC card at the customs or does the custom officer needs to take it and read it in a machine? I just show it to them – but they do hold it – yet it isn’t scanned. Of course you still need your ID / passport – this isn’t an ID card – its simply like a VIP card. thanks for this epic comment TJ! Looking at several Canadian crossings soon. I have GE and APEC. believe its just for Asia – but to be honest not sure. Glad you liked the article! Well – yes APEC isn’t for immigration – you still need a visa in those places. I also carry a pamphlet to explain APEC with me when I’m traveling as well as the actual letter that the card came with – to give the customs official something as well. Many of them still havne’t seen it. I took a friend with me in Thailand without an issue – but normally I travel alone. Would love to hear if others have this experience. Hi this is probably a dumb question but if my boss is already has his Global Entry Number assigned what steps can he bypass and where does he begin his process in applying for the APEC card? I am his personal assistant so I basically just give him the final paperwork for him to sign. So all the application filling out and preparation falls on me to take care of so any help is greatly appreciated. I understand that US citizens CANNOT use the card like a visa for China and Russia since the US is only a transitional member of the APTC program. Is that correct? Americans CAN use the card for other participating countries, but the visa application process still looms over us card holders in the case of China and Russia. ya, I don’t use the APEC card as my visa when entering China and Hong Kong – I simply use it to go in the diplomat link for faster border crossing. hope that helps. If you get a NEXUS card first, it will cost less and you can add Global Entry for free. However, you will need to interview at one of the locations with both Canadian and US Immigration officers. I did GE first and had to pay the full cost to add on NEXUS. I don’t know the process to add APEC card but I would expect you could do this at the same time since you need to interview with a US immigration officer. Is there business documentation you need to bring to the interview ? What question do they ask during interview? In answer to the earlier question about interviews for Global Entry (and APEC card) at the US Embassy Singapore, those were available (but backlogged for months) — I was one of the interviewees and it worked smoothly as of January 2018. Just went through KL immigration with my new US APEC card. They hassled me re the blank at the back of the card. I explained the new cards are like that but the officer said they haven’t been notified. She however let me through. Will see what happens when I try a different country in Asia. Just got approval for my APEC card yesterday (Aug 28, 2018). I had scheduled an interview (the first available was January 2019), but called the CBP office at the airport and they told me when I could drop in and officers would be available, since I just needed to provide another signature for APEC. Took less than 30 minutes. Very useful information but can I please check… Do we still need to apply VISA for Australia and Indonesia if we have the US approved APEC card? Reading through makes me realized that we have to still get VISA even though it is listed under the APEC? I travel a lot to Asia on business for my company. Am I still eligible for the APEC card? I am a US citizen.